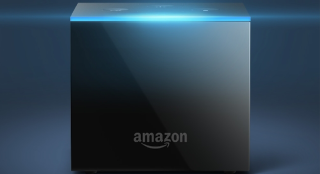 Fire TV Cube is an Amazon Echo speaker with TV streaming | What Hi-Fi? The merging of Amazon Fire 4K TV and Amazon Echo is the company's next entry into video streaming. As we hypothesised it might in April, Amazon has launched the Fire TV Cube - a fusion of its Amazon Echo speaker and Fire TV stick. The Cube plugs into your TV via HDMI, giving you access to the range of apps and streaming services (including Netflix, iPlayer and so on) that the Amazon Fire TV Stick and the Amazon Fire TV 4K can. What sets it apart from those products, however, is its built-in voice control and its 'always listening' approach - giving it more control over your set. Amazon says the Fire TV Cube will be able to control your television through its HDMI CEC connection, meaning that you can say "Alexa, turn on my television" (or even ask it to start a specific show or genre) and your TV will flare into life even when it's turned off. While the Fire TV Cube supports HDR10 (plus, presumably, HDR10+ with Prime Video) and Dolby Atmos, it doesn't come with Dolby Vision. On the top are four buttons: a mute button, a button to activate Alexa, and two volume controls. But while Alexa can control the volume for your TV or soundbar even when you're using a different HDMI input, because Amazon's remote doesn't have volume buttons you'll have to use voice control to adjust volume - which we'll bet right now will be clunky. There are eight far-field microphones in the Cube, and Amazon suggest it can also use the microphones to "suppress noise, reverberation, content currently playing, and even competing speech" so your commands shouldn't be clouded by the sound from your TV. The Cube will also, of course, work in the same way as an Echo speaker - so the functionality isn't limited to that of the other Fire TV devices, arguably making it one of the most attractive entry-level Alexa products. You can also control it using a traditional remote. The box has an IR blaster on four of its sides (not counting the top and bottom), as well as having with a IR extender if you have to hide it somewhere inaccessable by infrared. There are a few other limitations: you won't be able to link it up with other Amazon speakers for multiroom, or connect it with a Bluetooth speaker. Nevertheless, we look forward to it hitting the UK so we can try it out. The TV Cube will be launching in the US first, for the pre-order price of $120 (approximately £90). Prime members can also pre-order Fire TV Cube on the 7th and 8th of June for $90 (approximately £70). Google 4K Pixel Player set to rival Amazon Fire TV Stick? Amazon Prime Video vs Netflix - which is better?